PHYSICAL SHAPE – Perma-Beads® are specifically designed to replace sand in any sand filter. Perma-Beads® do not have flat or porous surfaces that can stick together as in sand or other angular, irregularly shaped, or porous media. The smooth spherical shape of each bead prevents adhesion and bridging to other beads. This unique, spherical shape also creates optimal interstitial spaces between Perma-Beads®, trapping large quantities of debris thereby minimizing water use by decreasing both the frequency and duration of the backwashes. SURFACE PROPERTIES – The very hard surface properties of Perma-Beads® prevent bacteria from etching into the surface and the very slippery surface allows even the stickiest waste to be scrubbed off when the bed fluidizes upon backwash. In fact, as Perma-Beads® age, they remove smaller particles as a thin film of nitrifying bacteria covers each bead. These are the same bacteria that create bridging, clogging and channeling in sand and other media, but in Perma-Beads®, this process actually serves to trap smaller particles that are then easily removed in the backwash cycle. WATER QUALITY – Since 1989, Perma-Beads® have been used in thousands of filters, many of which are still consistently providing exceptionally clear water with the original load of Perma-Beads®. The 215 square feet of surface area per cubic foot provide a significant surface area for supplemental biological filtration, especially when an oxygenated flow of water enters the filter. EASILY INSTALLED – No plumbing changes are needed! The dense nature of Perma-Bead® media (1 cu. ft. = 55 lbs.) reduces the weight needed to replace sand by approximately 60%. The high density of Perma-Beads® also eliminates the need for any plumbing changes when switching from sand to Perma-Beads®. Simply remove the sand and pour in the Perma-Beads®. No plumbing changes are needed. PHYSICAL STABILITY – Perma-Beads® never need replacement and can even be repeatedly sterilized using chlorine without any adverse effects. 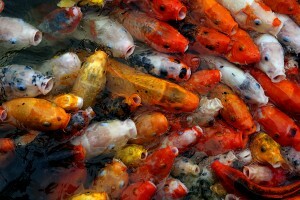 Perma-Bead® media has been in continous use in thousands of pond, aquaculture and municipal sites for over 20 years. HOW TO PURCHASE PERMA-BEADS® – Look at the filter or owners manual to find the filter manufacturer’s rating for pounds of sand and call (800-994-7599), with the make and model of the filter, for a price quote and answers to any questions you may have.